Happy birthday! To me, that is. My birthday was a few days ago, so today we’re talking about cake. Since I’m the baker in the house, I usually end up making my own cake, which means that, unless I want to spend hours in the kitchen, there’s no multi-layer masterpiece in the offing. So a few years ago I went on the hunt for a cake that would be super-great, but also wouldn’t force me to toil away to celebrate myself. I looked at a lot of pound cakes and other simple, one-bowl affairs, but while many of them were quite delicious, they didn’t have that spark of ‘oh!’ that you want in a birthday celebration. Until, that is, I came across a hand-written sheet of notebook paper in an unlabeled three-ring binder. It took a bit, but eventually I remembered what that binder is: about a decade ago, I found myself at my parents’ house over the holidays with nothing to do, and I started rooting through my mom’s recipe boxes. I copied out a lot of recipes that seemed interesting. Some I’d eaten before, but others were chosen out of a mix of caprice and happenstance. One of those latter ones was the oddly named ‘chocolate sheath cake’, which (the recipe card noted) came from the kitchen of one of my dad’s cousins. Mom apparently got it in a box of recipes at her wedding shower. The name was weird, the method was unusual (but the ingredients looked good), and it had a nice origin story: sold. But then it languished in the binder for years. Which is a real shame, because that chocolate sheath cake turns out to be a version of a well-known dessert, Texas sheet cake. Why ‘sheath’, I may never know — something odd with the consonants, apparently. But the recipe is a classic. A boiling mixture of water and butter is poured into the flour and sugar, which I suspect changes the gluten matrix just a bit (rather like the way boiling water makes Chinese dumpling skins more pliable). Then it’s leavened with baking soda, eggs, and buttermilk, which further tenderizes the crumb. Once you add in cocoa, cinnamon, and vanilla, the result is instantly likable, an amalgamation of true-blue American flavors. But that’s not all! The icing is really the coup de grâce. 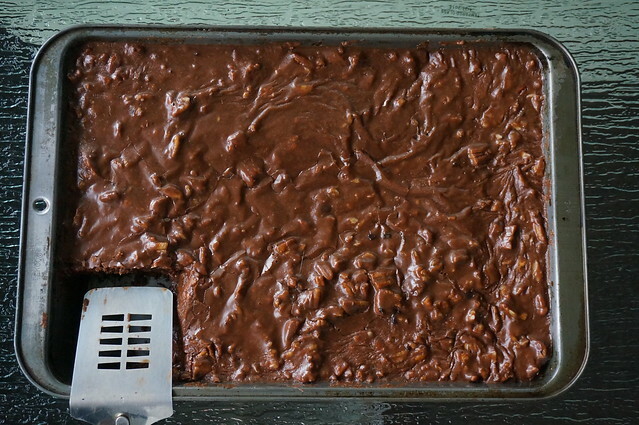 Poured on the cake while hot, it looks like a sort of ganache or glaze, studded with chopped pecans. But as it cools alongside the cake itself, something magical happens: it seizes up just a bit, turning into a thin, crackly crust that contrasts with the soft, fudgy cake below. And that combination has the spark that makes me says ‘oh!’; it’s been my birthday cake for years now. This year I didn’t happen to be at home for the day itself, so I made an advance cake to share with coworkers and now with you. If you have an August birthday like me, maybe you’ve found your cake! And if not, no matter: whip this up in mere minutes, invite some friends, and celebrate mine. No presents required! This has been my birthday cake for almost a decade: it’s simple, quick, and utterly delicious. The fudgy cocoa-and-cinnamon cake combines with a thin, crackly icing studded with chopped pecans, and it takes only 20 minutes in the oven. And you can serve the whole thing from the pan, picnic-style, which is incredibly convenient for parties and the like: this is one of my absolute favorites. Fair warning: it’s a cake for sweet tooths, which isn’t always my thing, but is always called for on birthdays. Adapted from a recipe from the kitchen of Lois Wright. Preheat oven to 400°F and grease a 9×13-inch pan; set aside for now. 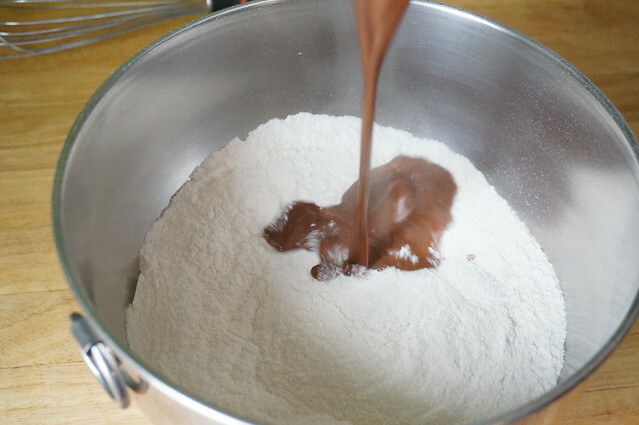 Sift the flour and sugar together in a large bowl. 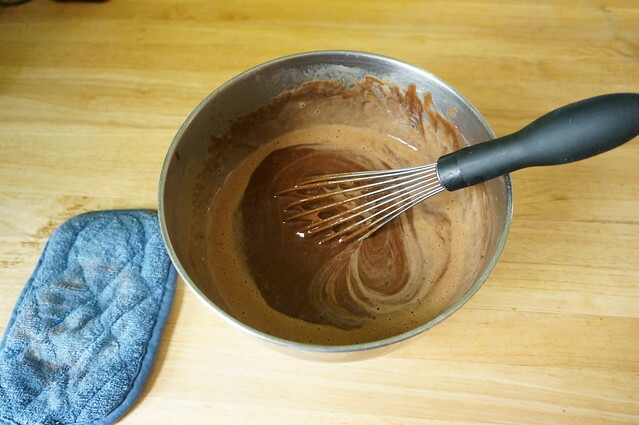 In a small saucepan, combine the butter, water, and cocoa. Bring to a rapid boil, and pour over the flour mixture. Stir until well-combined. 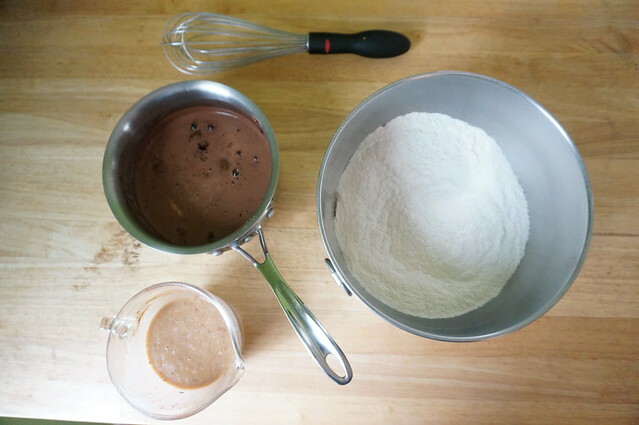 To the flour/cocoa mixture, add the buttermilk, eggs, baking soda, cinnamon, and vanilla. Stir to combine thoroughly. In a small saucepan, melt together the butter, cocoa, and milk. Remove from heat and add the powdered sugar, vanilla, and pecans: stir until smooth. Spread the warm frosting on the cake while both are still hot and allow to cool completely, at least two hours. 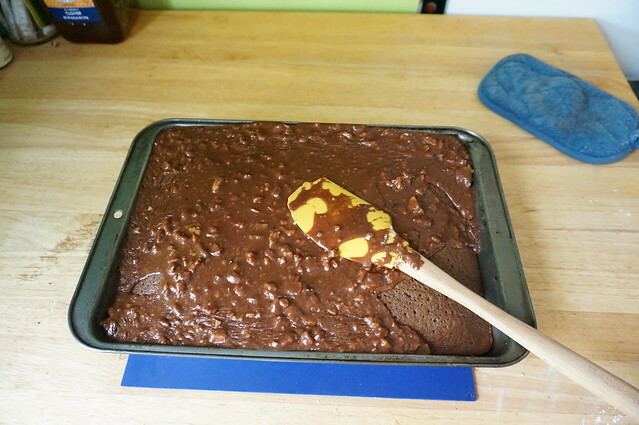 Texas sheet cake is generally served directly from the pan. It’s great as-is for a picnic, or you can serve it alongside a scoop of plain vanilla ice cream for a classic birthday treat. 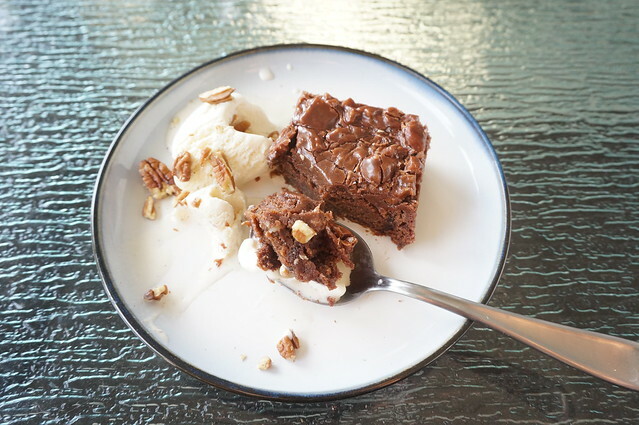 I personally find the idea of a pecan-less Texas sheet cake somewhat blasphemous, but technically speaking it should work just fine to omit them if you have an allergy or an urgent distate. Ditto (on both counts) for swapping in different nuts. Dairy free baking: I did once make this cake for a gathering with a number of lactose-intolerants, and it’s workable. Subs: for the butter, a butter-flavored spread such as Earth Balance; for the milk, plain-flavor soy milk; for the buttermilk, a half-cup of plain soy milk mixed with 2 tsp of white vinegar. Caveat: the frosting doesn’t get quite the same tempting crackle with the soy milk — something about the different proteins in the two milks, I’d wager — but it tastes equally wonderful.